Does Your Attic Really Need It? Unless you already have dust and debris in your attic regularly cleared out, then the answer is yes! Your home probably has countless projects to get done, so an attic cleaning may not be high on that list. However, dust causes far worse problems than being messy, so it's time to reconsider! There may also be rodent droppings, or even carcasses, causing issues that you might not even know of. What Harm Can Dirt Do? More than you might think! Dust build up in your attic creates the perfect environment for mold to begin to grow and spread. It's happy to eat into just about anything, and that includes the wood of your attic, as well as the belongings stored there. 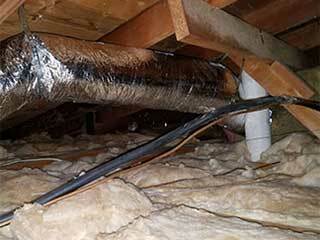 Aside from the potential health risk, this weakening of your attic's structure is not a good thing. Another issue is with air quality, as the dust can easily clog the vents in your attic used for air circulation, then pollute the air itself. It'll be brought into the rest of your home, which will aggravate issues like allergies, asthma, and any other breathing-related disorders. As for rodent droppings and carcasses, they bring about further difficulties. Both carry disease that can spread to belongings and be brought down into the house, and the smell can also reach past the attic itself. Even if you don't notice it, other pests such as bugs are bound to and will be drawn in by it, creating more problems. Let Us Clean Out Everything! We're happy to come out and get to work as soon as possible and will make sure that every bit of your attic is properly cleared out. We'll so do safely, so that none of the dust or otherwise will be able to enter your home. Your attic will be left spotless, and your household will be far healthier. Contact Attic Cleaning Glendale today and let us get to work for you!